Someday soon (mid-December? ), cold weather will be upon us and, because we are Texan, schools will close, highways will be shut down, and we will forgo crazy burgers and precious New American dining for warm, comforting comfort food (no, chips & queso don’t count). So head to one of these locales for international dishes that can easily stand up to the great ramen surge any day. The Hightower’s best-selling roasted pork jowl bibimbap is one that will make you come back for more. 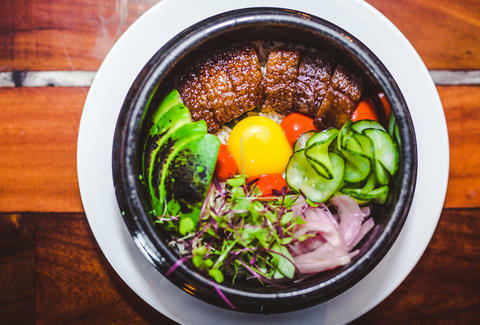 You get a Korean hot pot filled with white rice that is crispy around the edges topped with tender pork jowl, avocado, cucumber, pickled red onion, house Sriracha, and egg yolk that gets stirred until everything is mixed. This warm, filling dish hits all the flavor points: savory, spicy, crispy, acidic, umami, and sweet. Owners Gary and Jessica Wu’s General Tso’Boy is less traditional Chinese and more modern mashup with its perfect marriage of Chinese-American flavors incorporated into soft and crunchy French bread. Start off with the original sandwich, General Tso’s Chicken -- battered chicken thigh, sweet/savory sauce, lettuce, tomato, and mayo on a fresh-baked Easy Tiger roll. Take your "comfort” (aka food coma) to another level with the cheeseburger spring rolls and homemade soft serve. Although CANTINE Italian Café & Bar (owned by the folks behind ASTI Trattoria) is technically an Italian cafe, its menu is peppered with dishes that reflect flavors found in Italy’s Mediterranean neighbors. 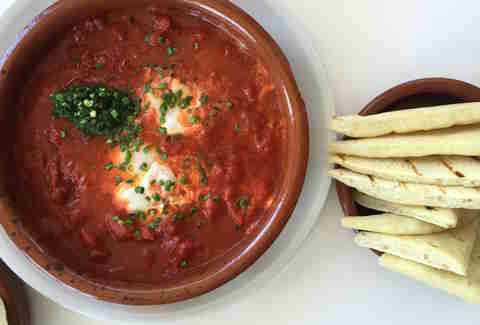 The brunch shakshuka is a perfect example of this -- a hot dish comprised of hearty harissa-spiked tomato sauce and z’hug (Israeli hot sauce), topped with local Vital Farm eggs, and baked until bubbling. Eaten with torn pieces of warm house-made pita, the shakshuka is a perfect cool-weather brunch food made only more perfect by adding chorizo. You already know that Thai-Kun on East Sixth is the bomb dot com, but the Domain North location has three times the menu items, and chef Thai Changthong himself can be seen at the grill. While it’s almost impossible to choose a favorite, for the sake of a ramen alternative, we’ll go with the only-available-for-dine-in-lunch black noodles: stir-fried rice stick noodles, pork, meatballs, liver, sweet soy sauce, bean sprouts, celery, pickled mustard greens, and peanuts. 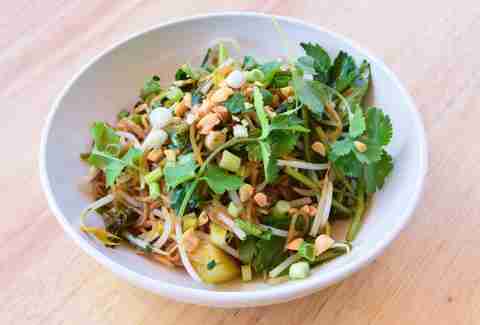 Essentially, it’s a Thai flavor explosion. Brazilian food truck Boteco is still somehow flying under the radar, but with food this great combined with the friendly atmosphere provided by owners Lauren and Fernando Marri, it won’t be for long. The small menu has a handful of appetizers but really only one entree, the picanha grelhada, a dish commonly found in Brazil. What is it? 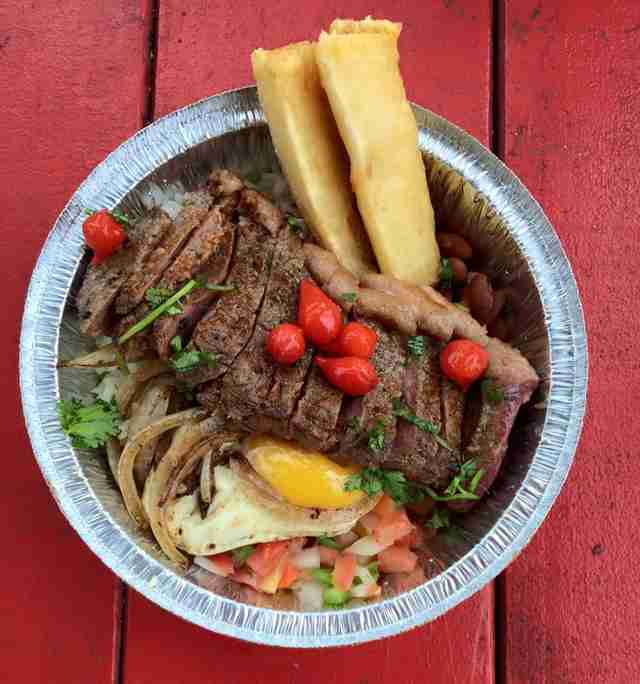 Its flavor-packed, sliced, medium-rare sirloin steak seasoned with Brazilian spices served over white rice, beans, and yuca flour, and topped with a sunny-side-up egg and fresh salsa (the portion is large enough for two to share). Be sure to try an order of Boteco’s perfectly crisp yuca fries on the side. For only $5 you can get The Don, a fairly large portion of Don's homestyle comfort food. 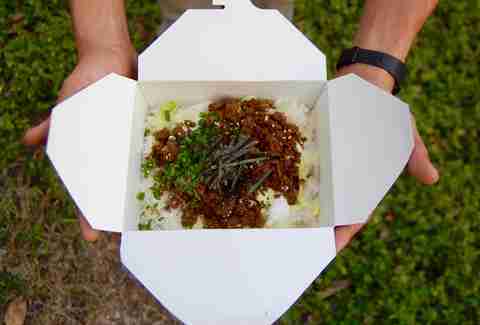 It’s a bed of rice and lettuce topped with slices of either golden-fried chicken or pork, sauce, and nori. Regulars know that adding onsen (soft) egg or avocado for a buck more is a great deal. Don Japanese can be found just behind the University Co-op. 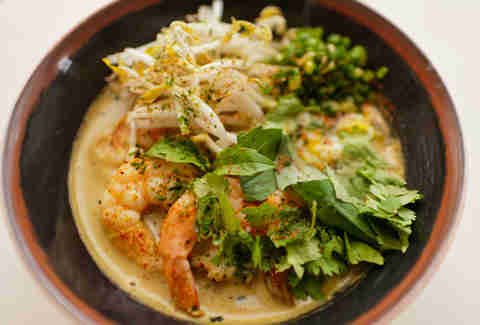 The Peached Tortilla is known for its flavorful Asian-fusion cuisine, and the Malaysian Laksa soup is no exception. The soup is a generous bowl of poached shrimp and tonkotsu noodles in an aromatic curry seafood broth topped with a 45-minute egg, cilantro, bean sprouts, and green onions. The level of cozy satisfaction this soup leaves you with kicks ramen’s behind... you know, if ramen had a behind. 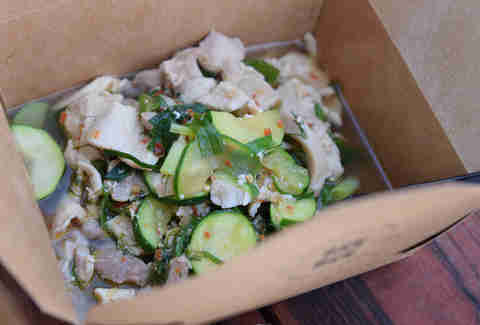 While the concept of cold noodles may sound odd, let us assure you that it is indeed the opposite. A nest of cold Japanese udon noodles -- the chilled temperature reveals the udon’s lovely flavor and texture -- is served with a bowl of warm, savory tsuyu broth. 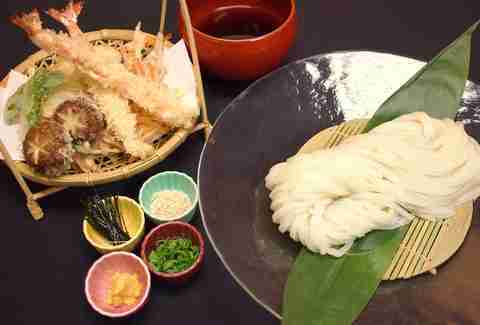 The Ten-Zaru at Daito comes with a side of tempura fried veggies that also get dunked into the broth. This broth-y chicken should be called “OMIGOD” chicken, because the warm, fragrant dish is out of this world. The Northern Thai truck located next door to Stay Gold is a gem, and has many food-industry devotees. Dee Dee’s Om Gai is comprised of chicken in a thick broth flavored with dill, lemongrass, chili, spring onion, and Thai basil, plus a side of Thai sticky rice perfect for sopping up the herbal broth. Julie’s hand-pulled noodles are some of the best in Austin, and are showcased in the signature beef noodle soup -- a large bowl of savory broth, beef, and wide noodles. Portions are large for the relatively small price, so you’ll get a couple of meals out of one order. And if you live in North Austin, there is a Julie’s brick & mortar next door to Ramen Tatsu-ya that has a spacious dining room. Two words: Chicken. Soup. Everyone knows it’s great. For $6.25, you get a bowl of soup -- big enough for a whole other meal -- of tender chicken, broth that has been simmering for hours, squash, zucchini, carrots, and avocado. For cold weather, when you have an actual cold, or you had a few too many the night before, Julio’s soup is the magic remedy. Sign up here for our daily Austin email and be the first to get all the food/drink/fun in town. Anastacia Uriegas is a food and drink writer in Austin whose favorite international dish is Maruchan ramen (roasted chicken flavor). Follow her MSG-induced hallucinations at @anaurie.